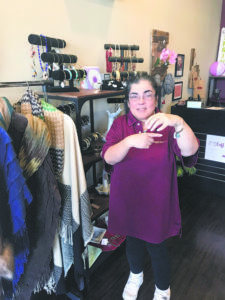 One Stop Gift Shop gives those with disabilities the opportunity to learn retail skills. 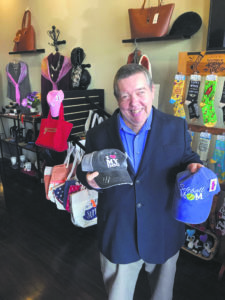 Last summer, an unassuming space in the strip mall along Levittown Parkway in Hicksville took on a new name, One Stop Gift Shop. 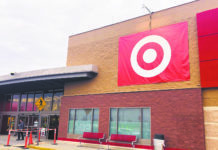 The June 26 grand opening saw a large crowd of community members who had come out to support the latest effort by AHRC Nassau to help provide retail experience to those with disabilities. Now, nine months later, One Stop Gift Shop is currently hosting its second round of apprentices, giving them an opportunity to work and grow in a professional environment as they gain experience stocking, selling and handling products, developing customer service skills and handling money transactions. Claire Himmelmann likes the socks the best, especially the pair with dogs on it. Current participants include Frank Lopez, Patty Fran, Claire Himmelmann and Kenneth Bicking. Fran, who started apprenticing in February, commented that she’s gotten better at handling money and has improved her customer service skills. She hopes that by the end of her experience, she will be more confident in speaking to people. Bicking has similar goals. Since starting in January, he explained, he’s learned how to add up money and how to treat customers with kindness. 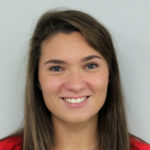 Once Himmelmann completes her apprenticeship, she hopes to obtain a job working with dogs. 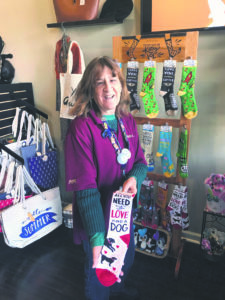 In fact, she enjoys dogs so much that she pointed out her favorite product in the store—a pair of socks with dogs on them. Kenneth Bicking says his favorite product in the store is baseball caps. The eclectic shop sells everything from wallets, handbags and homemade dog biscuits to baseball caps, jewelry and custom letters and shapes made from corks. No two items are alike, and every shopper is guaranteed to find an affordable gift to take home. 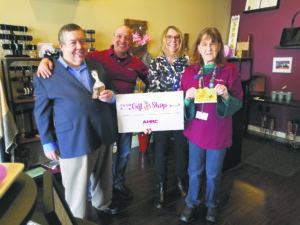 AHRC, a nonprofit organization that provides supports and services for those with intellectual and developmental disabilities, established One Stop Gift Shop as one of the company’s day programs to employ those with disabilities. The ultimate goal of One Stop Gift Shop is to enable participants to build a resume so they can one day find and independently work a job outside of the program. After its last group of participants finished their six-month apprenticeship, one woman was able to secure a job at a national chain retail store in a local mall. Patty Fran enjoys the bracelets that One Stop Gift Shop sells. The quaint shop is located directly next door to the company’s Hicksville office. 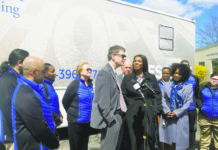 Along with providing employment for those with disabilities, the organization also provides volunteer services, in-home services and residential opportunities for those with disabilities that seek living on their own or with others. Shop the One Stop Gift Shop at 113 Levittown Pkwy. in Hicksville. Mention this article to receive a 10 percent discount. To learn more about the AHRC, visit ahrc.org.